Mosquitoes were on the agenda for a special meeting of the Dillon County Council on Wednesday. Dillon County Councilman T.F. 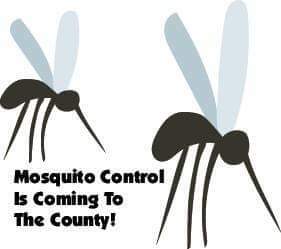 “Buzzy” Finklea, Jr., said that he took the mosquito problem on and discussed with the Interim County Administrator of the possibilities of what they could do. He said he has had more phone calls on this mosquito issue than on any topic since he has been on council, and the county needed to do something to help the citizens with this issue. They had Charles Taylor, a county employee who has done this type of work in the past, look into some prices for a mosquito machine that would go on the back of a pick-up truck. The best machine they can get is $8,400, and it would take at least two to cover the county as a whole. If at least two are purchased, the cost would be $8,000 each. They also checked into the price of the chemical. Finklea said that he felt this was the way for the county to go and that way if they have another hurricane, a wet season, or other problems with mosquitoes, then the machine would be theirs and they would be able to act immediately. He said he hoped that eventually they could get help with the cost of the mosquito equipment, but even if they couldn’t, they needed to move forward. Councilman Archie Scott asked what the pros and cons were of aerial spraying and spraying from a truck. Interim County Administrator Lisa Gray said that while the aerial spraying is more effective that the cost to spray the county one time would be more than a half million ($500,000) based on the per acre price. She also said she didn’t know if they would get reimbursed, but she looked into what FEMA says has to be done prior to spraying such as mosquito counts, landing counts, testing for diseased mosquitoes, notifying beekeepers, etc. Finklea said they may or may not be able to get reimbursed, but said every county around Dillon is spraying, and the council needed to step up to the plate and do something. Councilman Harold Moody said he would recommend two machines and said that the hours of some county employees could be shifted so they could spray the populated areas of the county. Chairman Stevie Grice said he was told that these machines could spray up to five hours. Finklea said if there were not trucks available they could use some of the trucks being taken home by employees. Gray said those spraying may have to be certified. Finklea said he thought it was possible that they could work under someone who was certified, and Charles Taylor is certified. Archie Scott said they need to do whatever they can do and put their best foot and their best resources forward. He suggested purchasing three machines. Gray said that they may have to request a state contractor to do the mosquito counts, which would mean more money. She said they wouldn’t know if FEMA would approve the reimbursement until 2019. She also noted there were efforts in the Governor’s Office to obtain funding to help those in the hardest hit areas. Gray also noted that the county had written a letter to the governor. Finklea said they need to go ahead and get the machines and start spraying. “If we keep putting it off, it will never get done,” he said. Grice said they could go ahead and be doing the mosquito counts, etc., while they were waiting for the machines to come in. Finklea said that Disaster Preparedness needed to notify citizens by the phone system when their area is going to be sprayed to help citizens and beekeepers like himself have time for preparation. Archie Scott made the motion to purchase three mosquito machines, the chemicals, and to do what is necessary to get this moving forward and to get possible reimbursement. Moody seconded the motion. All present—Scott, Moody, Finklea, Grice, and Gerome McLeod—voted in favor of the motion.